It’s been going on for what seems like forever and it’s really starting to get to me (although maybe that’s because of the unbelievable toothache I’m living with until I get three teeth pulled on Wednesday). We had drilling that went on so long I’m surprised they didn’t come out in China! I think they found a lot more rock under the back garden than they expected. We’ve had so many vans parked in our end the small cul de sac that it required 13-point turns just to get out of the drive-way. There have been mega-skips that required everyone in the area to move their cars (which were parked on the road because thanks to all the vans they couldn’t get into their own driveways) in order to reverse into the driveway. We’ve had landscape gardeners putting up trees that apparently (yes seriously!) have to be replaced every six months. I could go on but – today it’s painters. They have put (with my parents’ agreement) scaffolding into the side passage of our house, because the houses here are very close together. We’ve had to move our cars our of our own driveway and park them way around the corner to be out of range of the paint spray. It’s been going on for about 4 months now, and I hope to Christ they’re nearly finished. I mean they paid €1.2m for the house, and must have spent the guts of another €0.5m on the renovations… People that rich shouldn’t be living here, they have other places for people like that! This is an upper middle class kind of place, not a very very wealthy kind of place! 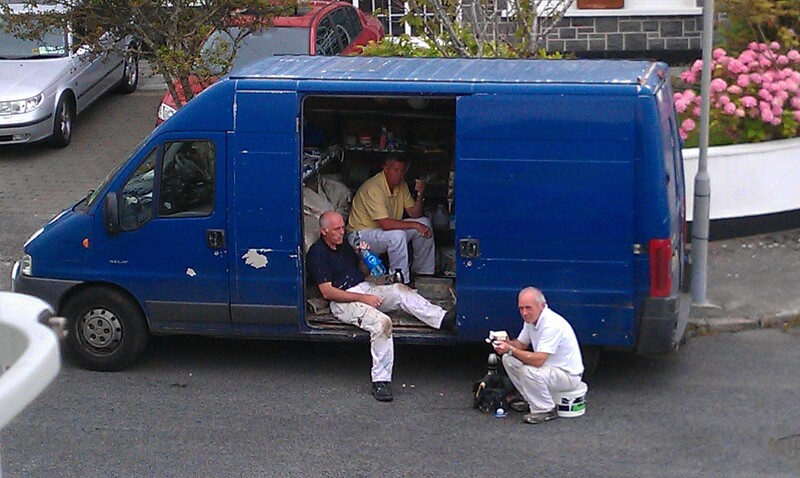 Re photo: I looked out the window and saw them in the van as you see them in the photo, and something about it just struck me as “classic builder/tradesman” – the van, the sambos and tea…. I don’t know why, it just appealed to me. However, I have warned them vehemently not to leave the side gate open in case Willow gets out. If she does, I’ll knock over their scaffolding with them on it! ~ by Lynn Duffy on July 25, 2011.